Sara Wanderlust: Catch Comedian Pablo Francisco LIVE in MALAYSIA! Say what? 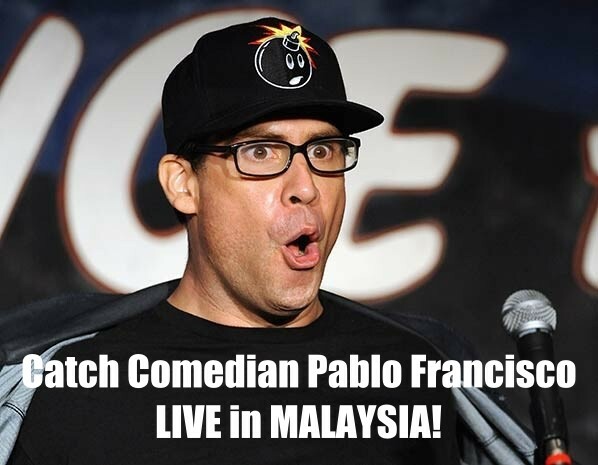 Pablo Francisco in Malaysia?! The news is out! Pablo Francisco will rock the house with screams of laughter this coming September in Malaysia. Comedian fans, you would know that he is one of the most popular touring comedians worldwide and has earned a reputation for his unique talent to weave together his one of a kind arsenal of off the wall characters and spot-on impressions. Francisco draws his audience into his vivid imagination and takes them on a wild ride as they experience his spontaneous outbursts, clever insights and some of the funniest rapid fire comedy, ever unleashed. Malaysian fans will have an opportunity to catch a glimpse of Pablo’s hilarious new material as he prepares to shoot a new one-hour comedy special entitled “Here We Go Again.” The funny man’s first visit to Malaysia will take place at KLCC Plenary Hall on the 22ndof September 2018 (Saturday), at 8:00pm. 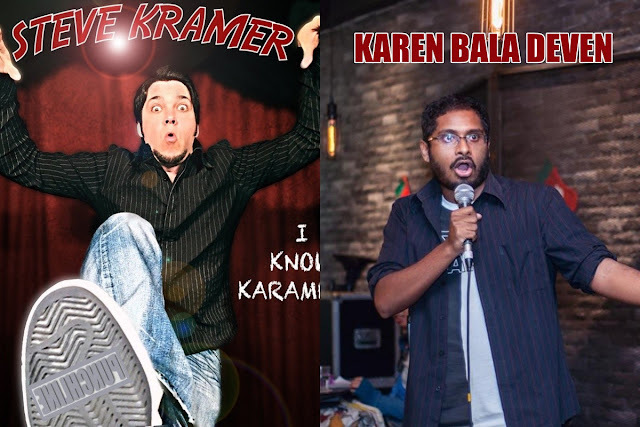 ‘Pablo Francisco Live in Malaysia’ will also feature Steve Kramer, an upcoming American comedian, and Malaysia’s very own, Keren Bala Deven. Also featuring Steve Kramer and Keren Bala Deven! Pablo’s global appeal is evident in his past three Australian tours where he sold out shows in Melbourne and Sydney. Previous to that, Francisco had his second visit to the South African Comedy Festival. Francisco’s amazing international appealcatapulted him to rock star status selling out the world renowned Milky Way in Amsterdam. Of Pablo’s six phenomenal European tours, his stand out performance on his third 16 city tour at the Troxy in London and sold over 26,000 tickets. Francisco’s international profile continued to soar as his universal fans welcomed him for yet another multi-country tour this past fall with staggering excitement. Those who experience Pablo’s show for the first time find themselves mesmerized by his hilarious dead on impersonations. Gene Lavanchy of FOX – TV Boston calls Pablo “the most talented comedian in the business today”. His unbelievable ability to physically morph himself into movie stars, singers, friends, family, and a multitude of nationalities gives Pablo’s show a universalcharm. His drop-dead funny spoofing often leaves his audiences struggling to catch their breath which is the driving force behind his huge success. Pablo Francisco Live in Malaysia is proudly brought to you by Phoenix PR, and tickets can be purchased at http://pablofranciscoinmalaysia.peatix.com. Fans of Pablo are up for a treat as the first 1,200 seats will be sold at discounts up to RM 50 off! So what are you waiting for? Get your tickets ASAP as they're selling out as we speak. 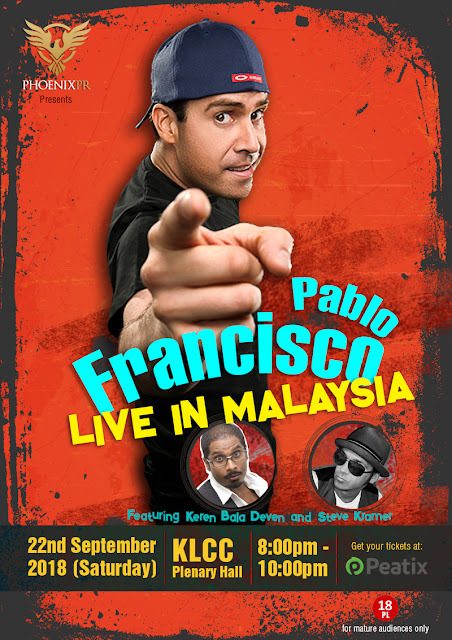 Its not everyday that you get to see Pablo Francisco live in Malaysia, so lets give him a warm Malaysian welcome and hope that he comes back again. I personally think that the pricing of the tickets are not too bad, and its pretty obvious that you'll save even more if you manage to grab yourself the Early Bird Price tickets! Not a chance to be missed if youre a fan of comedy. Alternatively, you can also checkout his official websites and pages below for your convenience. It can either be your cup of tea, or your cup of coffee, cause comedy is everyones favourite cup. HAHA. Not sure i got that joke right, but im sure Pablo Francisco will.